Just because you’ve got friends coming for a summer dinner party doesn't mean you have to be stuck in the kitchen all day! We’ve collected some recipes for simple and seasonal food that’s just a little bit special. So your guests will think you’ve been in the kitchen all day. All our recipes use food that will be in season in the summer, and all can be made or prepared in advance. Cut the butter into small cubes and return to the fridge while you prepare the sauce. Place the onion and vinegar in a small pan and heat gently until the onion is soft. The vinegar should be mostly evaporated so keep an eye on it to make sure it doesn’t burn. Remove from the heat and add the butter, whisking well. Serve immediately with the cooked asparagus. To prepare in advance, pre-cook the onion and vinegar and set aside until you’re ready to eat. Return to the heat and warm through as you add the butter. 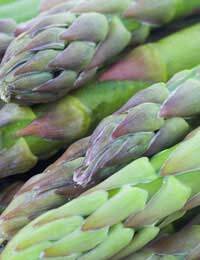 Cut off any woody ends from the asparagus and peel away any thick skin remaining near the base. Tie the asparagus in individual bundles of 5. In a pan that is wide enough to take the asparagus lying down, bring some water to the boil. Add the asparagus bundles and simmer for about 8 minutes or until a knife inserted in the base of a stalk slips in easily. Drain very well and serve with the butter sauce. Asparagus doesn’t travel well so wait until you see British asparagus in the shops for this recipe. Place the salmon steaks in a greased baking dish. Sprinkle over the dill and lemon zest. Add the bay leaf to the dish and season with freshly ground pepper. Pour over the cream. Cover with foil and bake for about 25 minutes. Serve with fresh tagliatelle or new potatoes, broccoli and carrots. Top and tail the gooseberries and strip the currants from the stems. Wash and place in a saucepan with the sugar. Over a very low heat bring slowly to the boil. Shake the pan occasionally to help the sugar dissolve but don’t stir as you want the fruit to remain whole. Allow to simmer, covered, for about 5 minutes. Add the other summer fruits and shake to mix. Allow to cool, then pour into a glass bowl and serve, chilled, with thick cream. Put 4 oz raspberries in a bowl and crush lightly. Sprinkle the sugar over the raspberries. Beat the cream in another bowl until it is thick but not stiff. Slowly add the wine, beating gently until well-mixed. Add the cream to the fruit and fold in carefully. Divide the remaining raspberries between 4 glass dishes and top with syllabub. Serve with crisp home-made shortbread finger biscuits or these almond crisps. Cream together the butter and sugar until light and fluffy. Add the egg yolk and a few drops of almond essence and mix well. Finally add the flour to make a dough. Roll into a log shape and slice into 24 rounds. Shape each of these rounds into a barrel and roll in the chopped almonds. Place well-spaced on a greased baking sheet and cook for about 15-20 minutes. Allow to cool.